The Texas Pecan Pesto Pasta at Dish Society offers local ingredients without red meat, or guilt. Photo by Kimberly Park. With its beads, revelry, drinking and feasting, Mardi Gras is a convivial and well-loved celebration. Then comes Lent and it’s a real downer. Suddenly, people you were having happy hour with slink away because they gave up alcohol. Other friends turn down dessert because they gave up sweets. Lent, the 40-day period of penance, sacrifice and almsgiving from Mardi Gras to Easter Sunday, has been observed since the fourth-century. It is intended to help people reflect inward and change behaviors, cleansing them and renewing them for Easter. Catholics abstain from meat on Fridays; many Eastern Rite denominations give up meat and other animal products for the whole of Lent. Soul-searching is good. Starving is not. Fortunately, the outstanding restaurant options in Houston make Lent not feel like it’s not that much of a a sacrifice. Dishes like this Tamarind Salmon at Ambrosia are excellent options for observers looking outside the fried-fish box. Photo by Dragana Harris. Ambrosia, 2003 Lexington: Tucked away on a side street just off of Shepherd near Highway 59, the Southeast Asian restaurant specializes in inventive small plates. (Many of those have been recently developed by chef Micah Rideout, formerly of Potente and KUU.) These fit the bill for hungry Lent observers on the prowl for interesting meals. 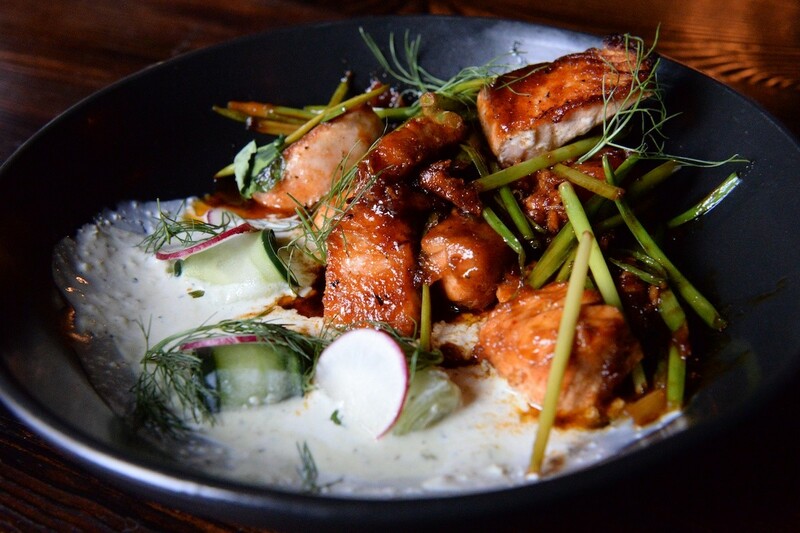 One option for those substituting fish for meat is the Tamarind Salmon, which is brushed with pad thai glaze and served with cucumber ribbons, garlic shoots and chili yogurt. Pro tip: Pair it with the restaurant’s Tom Yum Shishito peppers, blistered over a grill and served with hot and sour sauce. Asia Market Thai Lao, 1010 West Cavalcade: Yes, diners may have to forego Asia Market’s Isaan-style fried sausage, but that doesn’t mean they can’t indulge in one of the Thai curries. Though classics like massaman and yellow curry are always hits, the season begs for exploring the vast array of other options. Try the Fish Curry Kanom Jeen Nam Ya, a Southern Thai specialty that includes rice stick noodles in a spicy coconut curry. Though fish is the traditional protein in the dish, shrimp can also be used. The curry is served with an assortment of raw vegetables and pickles, which can be eaten separately or stirred in with the noodles. 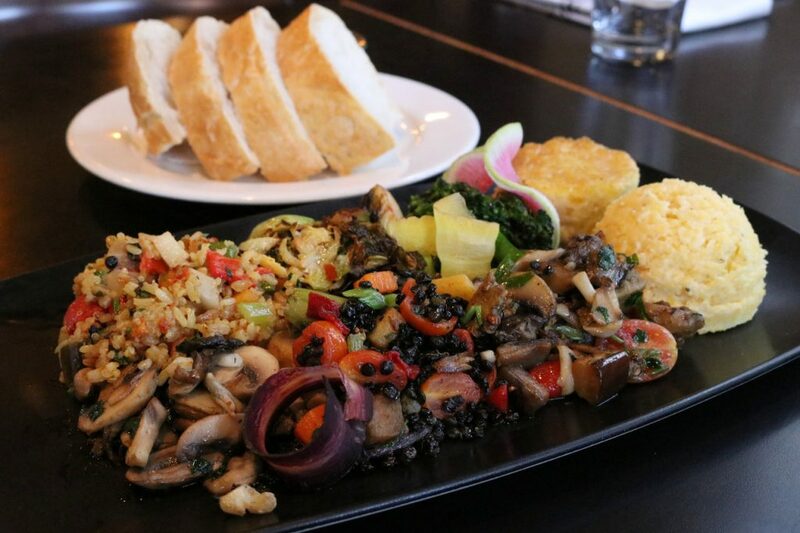 Backstreet Cafe’s seasonal vegetable platter is a great meatless option for Lent. Photo courtesy of Backstreet Cafe. Backstreet Cafe, 1103 South Shepherd: There are multiple meatless options at this mainstay managed by three-time James Beard Award nominee Tracy Vaught of H-Town Restaurant Group, including a whole Oven-Roasted Cabbage with Houston Dairymaids Affinee Blue Cheese-almond stuffing and a lentil salad with roasted baby carrot, avocado, onion, piquillo pepper, housemade burrata, ground pistachio, lemon and olive oil. The real standout, though, is the Seasonal Vegetarian Platter, a gargantuan delight of healthy-yet-delectable items like mushrooms, onion, broccolini and grains. Caracol, 2200 Post Oak: This Galleria Mexican restaurant (also part of the H-Town Restaurant Group portfolio) has several meatless options. With choices such as the Calabaza Rellena, a roasted mini-pumpkin stuffed with black rice, wild mushroom and raisins; and the Coctel de Vegetales, a vegetable cocktail of purslane, cherry tomato, avocado, asparagus tips and baby carrot peel, Lent will feel much more like an indulgence than a sacrifice. Dish Society, multiple locations: If you’re on your best eating behavior this time of year, you can feel extra good about matching your dietary needs with Dish Society’s locally sourced ingredients. If you find yourself in the mood for something a little more indulgent than salad, the Texas Pecan Pesto Pasta hits the spot. 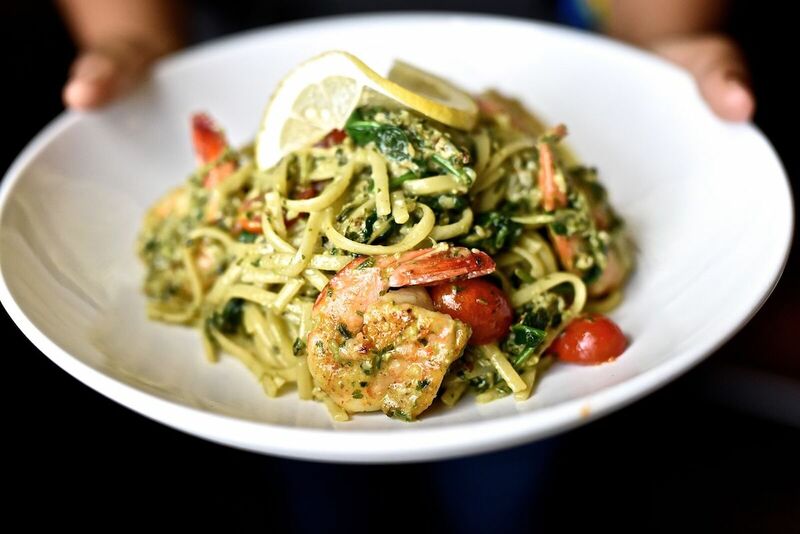 Linguini is mixed with housemade Texas pecan basil pesto, creme fraiche, spinach, grape tomatoes and Parmesan. For extra protein, add shrimp to the mix. Etoile’s bouillabaisse is available every Friday at dinner during Lent. Photo courtesy of Etoile Cuisine et Bar. 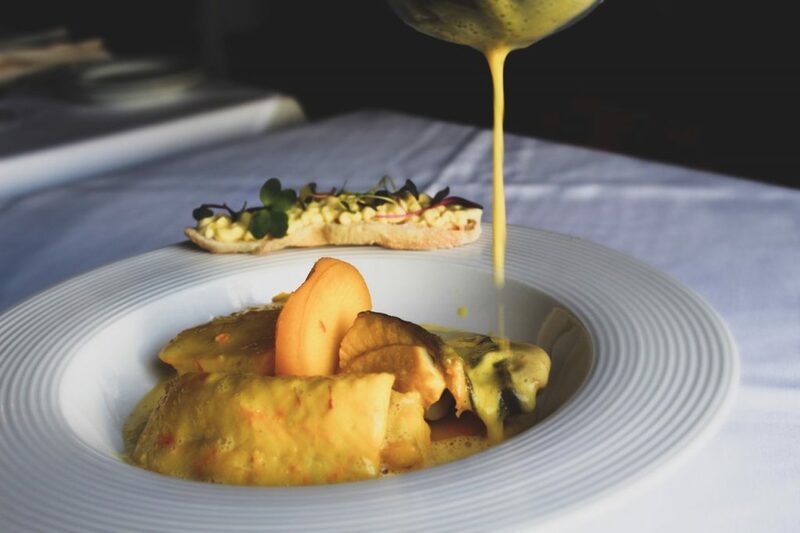 Etoile Cuisine et Bar, 1101-11 Uptown Park: Chef Philippe Verpiand must be translating “abstinence” as “indulgence,” given the bouillabaisse he’s offering on Fridays from February 16 through March 30. The traditional Provençal fish stew is made with fresh seafood and simmered in vegetable broth. Those observing Lent might forget they’ve given up anything. Helen Greek Food and Wine 2429 Rice and Helen in the Heights, 1111 Studewood: In addition to the winning Greens N’ Cheese Pie, another meatless standout is Frixos’s Catch, a whole roasted stuffed branzino served with chickpea puree and a mint salad tossed in ladolemono, a traditional Greek lemon oil sauce. Kenny & Ziggy’s New York Delicatessen, 2327 Post Oak and 5172 Buffalo Speedway: Lent might be a Christian season, but this Jewish deli has observers covered with a number of meatless selections. There are simple, satisfying options such as the grilled cheese sandwich or a bagel with lox and a schmear. For heartier fare, though, try Fat Fannie’s Famous Baby Snapper, made with caramelized onions, tomatoes, red peppers and scallions in a sweet and spicy Szechwan chili sauce. It even comes with two sides. 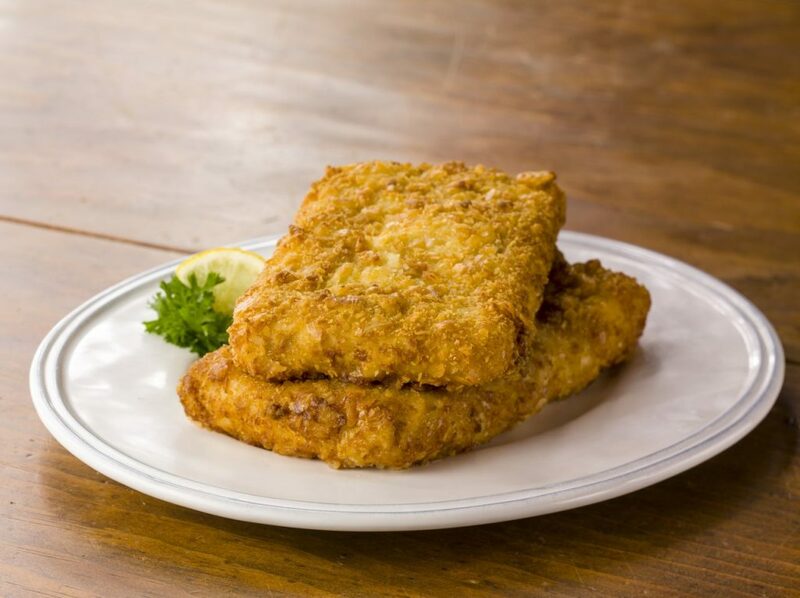 Fried fish is Lenten comfort food. Photo courtesy of Luby’s. Luby’s, multiple locations: Diners craving comfort food should not overlook this beloved Texas cafeteria’s seafood selections. The DIY menu means guests can select an entree and sides that hit the spot. In addition to the popular fried fish, there’s blackened tilapia and many other options. Tex Mex isn’t just about the enchiladas! 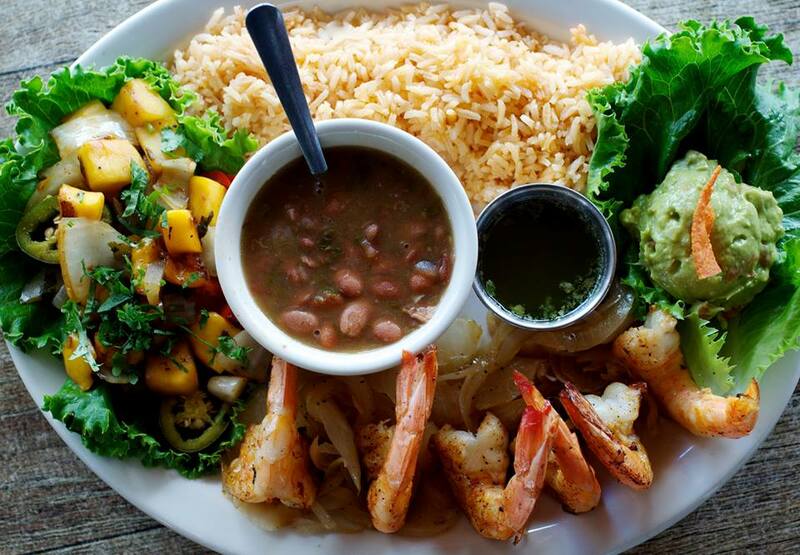 Let Lent be an excuse to try the shrimp and seafood at Molina’s Cantina. Photo by Kimberly Park. Molina’s Cantina, 7901 Westheimer and 3801 Bellaire Boulevard: Though it’s may be possible to subsist entirely on cheese enchiladas throughout the Lenten season, here’s a a tempting alternative and a good excuse to try out the lighter side of Tex Mex. Molina’s Raulito’s Shrimp Special features jumbo shrimp sautéed in garlic butter and served on a bed of rice with frijoles a la char, guacamole and mango pico de gallo. We ask you again, ladies and gentlemen: where is the sacrifice? Nobie’s, 2048 Colquitt: It’s hard to beat a dish like Nobie’s beet and avocado salad, though there are several other veg-centric dishes on the menu that give it a run for its money. The vibrant colors look festive and the blend of firm beet and creamy avocado is terrific. The texture combo is vegan, yet it feels like being bad, not being good. It’s also a great option for those going dairy-free (through Lent or an ongoing New Year’s resolution). Because Nobie’s dishes are great for sharing, this one’s a no-brainer for groups eating out on Fridays. A favorite from the seasonal Plonk! menu, the Fire-roasted Arctic Char makes an appearance just in time for the Lenten season. Photo courtesy of Plonk! Beer and Wine. Plonk! 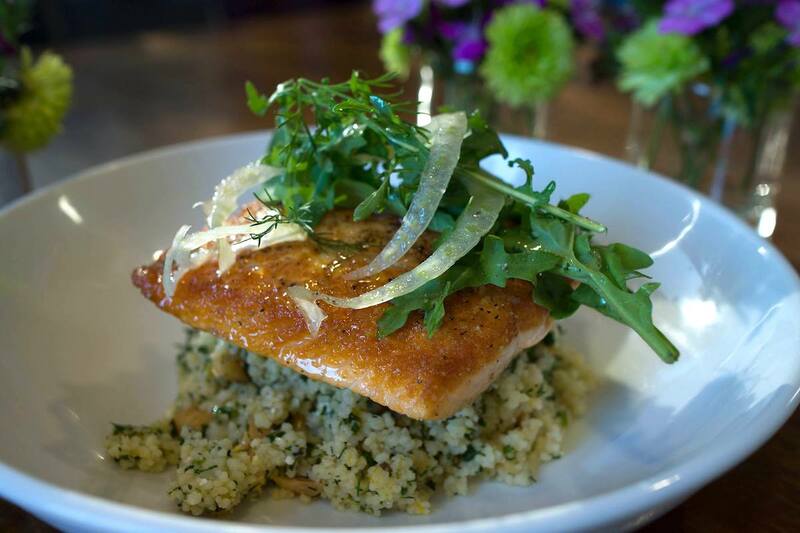 Beer and Wine Bistro, 1214 West 43rd: It’s worth a drive to enjoy the Lent-friendly Fire-roasted Arctic Char with Meyer Lemon Couscous, apricots, Marcona almonds, herbs and feta. Introduced in May of 2015, it’s one that Casey Thompson of Top Chef fame helped develop when she paid Plonk! a 10-day visit. The staff liked the char dish so much that they bring it back every year for a limited time, which happens to include Lent. Though the menu changes regularly with the seasons, the char will be available through at least mid-March. Prego, 2520 Amherst: This Rice Village Italian favorite has a multitude of dishes to help diners keep their Lenten traditions. Consider the Torta di Granchio, a Texas blue-crab cake with roasted corn, scallions and avocado; the Prego Salad with arugula, radicchio, portabello mushrooms, oranges in an apple-walnut vinaigrette; or the Pescatore, spaghetti tossed with Gulf shrimp, lobster, mussels, calamari and clams in a fra diavolo or white sauce. Crisped Rainbow Trout with Pecan Brown Butter at Rainbow Lodge. Photo courtesy of Rainbow Lodge. Rainbow Lodge, 2011 Ella: known for its meat and game, Rainbow Lodge has an extensive selection of seafood for those staying meatless on Fridays or even for the entire Lenten season. 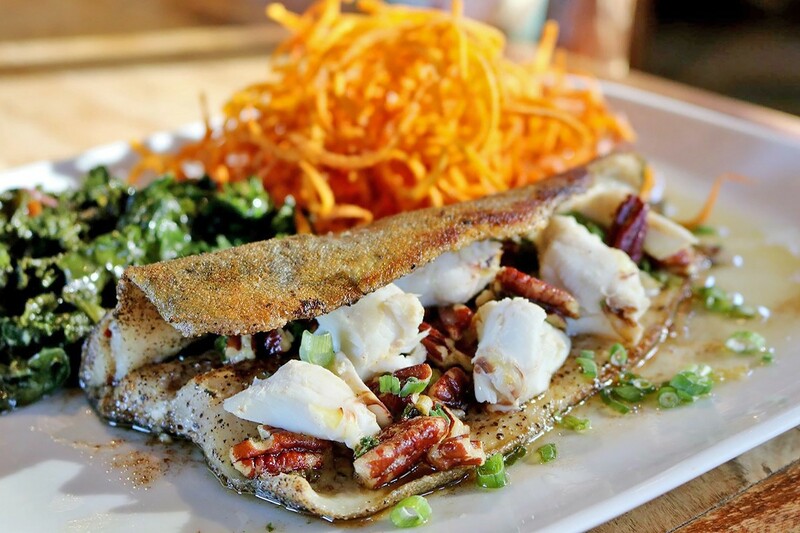 There’s lobster and herb risotto, made with melted leeks and baby arugula or check out the rainbow trout done with lump crab meat and pecan brown butter, accompanied by crispy sweet potato fries and sauteed kale. State Fare Kitchen and Bar, 947 Gessner Road: harder than one might think to find a satisfying vegetarian-friendly dish in a meat-loving town and those foregoing all meat during Lent may feel a little lost when it comes to eating out, especially outside of the Loop. State Fare comes to the rescue with its Farro Risotto-Style dish, which is meat-free but healthy, too. Farro, a whole grain in the wheat family, is prepared like creamy risotto and mixed with mushroom, vegetables, kale, Parmesan, and a tomato-basil relish. The resulting dish is warm, filling, and flavorful—a perfect match for the cold weather season and Lent observers looking for nourishment. just stay in Houston and eat. The annual Katy Sip 'n Stroll is this Saturday, April 27 from 6 to 9 p.m. at Villagio Town Center in Katy, TX. The event benefits The Ballard House and features lots of great food and drink. Read on for all the details! The long-running Katy Sip 'n' Stroll returns for its 17th year on Saturday, April 27. Verandah has introduced a new interactive option for its exclusive chef's table and we have all the details below! At recently opened Indian restaurant Verandah, the Upper Kirby District, chef Sunil Srivastava encourages diners to express their wishes and thus help determine which dishes are served.